Including the title, release date, track list and the exclusive listening party. Hopeless Fountain Kingdom album roll out mode is in full force as Halsey tweets out a mysterious link to a website called 'Find Me In The Kingdom'. Following the link leads to a bright yellow landing page with different time zones on it. 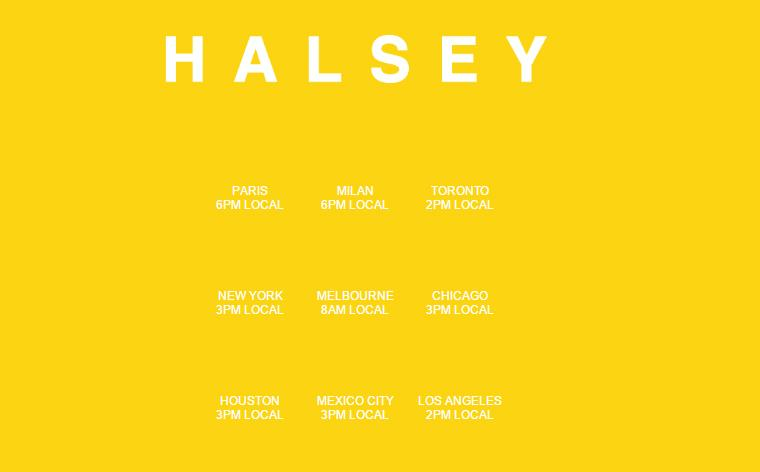 At 6PM Paris/Milan time, Halsey's site updated with two sets of coordinates. It appears that, as each indicated time lapses, more coordinates will be added to the site. After all nine coordinates and clues had been found, Halsey released the cover of the album. Then she tweeted a cryptic tease that is almost DEFINITELY pointing to the release date and time of the lead single from the album. 4/4/17. SHOOK. That was until Halsey replied to the sleuth and debunked the entire thing... sooooooo awkward. Halsey's album, Hopeless Fountain Kingdom will officially be released on June 2nd 2017. 3 months after our sleuth, Halsey has FINALLY revealed the title of her upcoming album - and we were (almost) right! Arriving in June, her second studio album will be called Hopeless Fountain Kingdom. But don't get too shook, because the image above is NOT the album cover. In fact, Halsey is going to send us all on another treasure hunt to find it. Today Halsey tweeted this alongside a tour date and moon emoji, alluding that ~something~ was coming. now. now it's starting. see you soon. The banner image on the 'Juliet'/@lunaauren account also appears to be of Halsey, as her tattoo is visible slightly. The moon imagery seems consistent across Halsey's and the new twitter accounts, subtly signposting that they are all linked. Halsey previewed four new songs for a select group of 100 fans while in London yesterday, sharing some images from the event via Twitter earlier this morning. While the fans were sworn to secrecy when it comes to specifics, a few new details about the record have begun to leak out. The new album is one of love and loss with songs based on the Shakespearean tragedy of Romeo and Juliet. Plus, the singer has confirmed that the album will have around 17 tracks and there will be more listening events around the world in the coming weeks. Watch this space! A mysterious new Twitter account and tumblr page have appeared over the last few hours that appear to be from Halsey herself. The Tumblr, oncelebratinglife.tumblr.com, features various pictures of the singer and her friends in woodland and city scapes, with a top headline that reads 'Counterweight' and encourages you to send love letters to a new email addressing referencing the new album's expected title The Kingdom. Furthermore, the Twitter account, @houseofangelus, teased what appear to be some lyrics and a call for fans to RSVP at a website that seems to involve some new music. must seek the fruit of a curious mind. Plus the Roman numerals in the Twitter image seems to confirm the June release date of the record. Basically, it's all a bit confusing but we're gonna be keeping our eyes peeled as further word gets spread from inside The Kingdom. WHAT DOES IT ALL MEAN?! 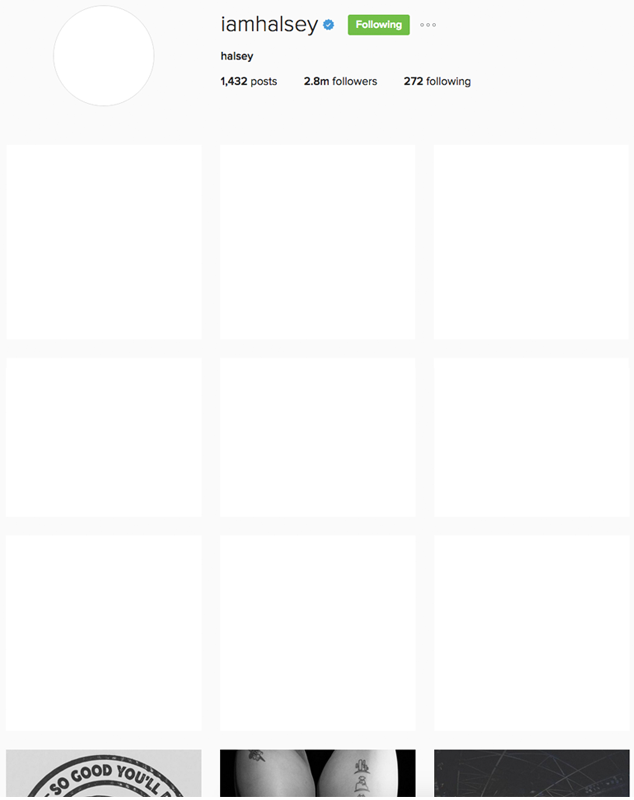 Has she quit social media by going blank? Is she preparing to launch a brand new aesthetic? Will there be a new album?! And followed it up by retweeting this from 2014. Honestly, we're so shook we can't think straight. Not only is it clear that Halsey's next chart topping album is on the way, it's pretty damn obvious that she's been planning this ENTIRE thing from the very first moment she dropped the 'Room 93' EP back in 2014. From 'Room 93', to the 'Badlands' and now onto the next chapter. But where are we going? What is the the first track on the 'Badlands' album? Castle. And what are the lyrics to Castle? "They've got the kingdom locked up"
And the last track on the 'Badlands' album? Young God. And what are the lyrics to Young God? The tweet above combines the lyrics of Young God with this tweet from 2014. She's literally been dropping hints about the narrative of her albums since 2014. The people aren't ready for the king and the queen. So basically, we've escaped the Badlands and we've made it to Kingdom and the fans can't handle it. y'all don't give Halsey enough credit. she's had all this planned out for a long time. she's really clever. 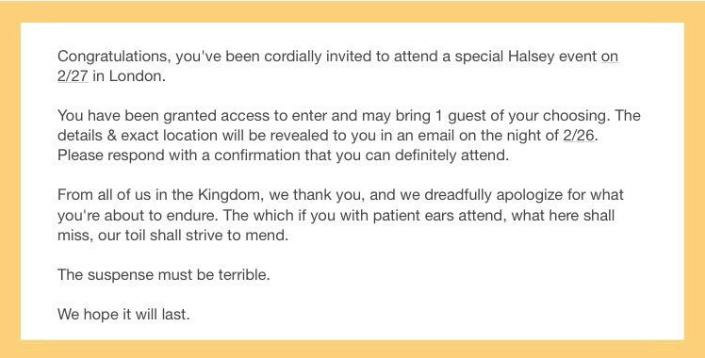 We'd like an ice cold cocktail waiting for us in 'The Kingdom' when we arrive, please and thank you!